'While Giants Sleep' by Andy Miller: Review in '630 Miles' - Newsletter of the SW Coast Path Assoc. 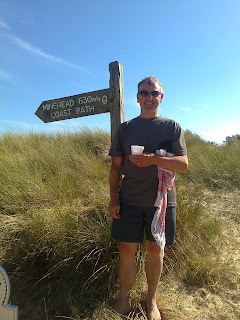 Review in '630 Miles' - Newsletter of the SW Coast Path Assoc. This review appeared in the 2012 Autumn edition of '630 Miles', which is the bi-annual newsletter of the South West Coast Path Association. It only comments on the final quarter of my book which is quite understandable given its specific focus. I'm very pleased with it nonetheless. How wonderful to be praised for your writing in someone else's publication. Congratulations. I've also read of the climbing exploit in which you had to rescue a rather impetuous teenage climber. I thought it was very well written; I could feel your urgency in the words you'd chosen. You really shouldn't doubt yourself. You are a writer. Thanks for your kind comments, Ange. I'm pleased you liked 'Hanging in the Balance', the piece about the cliff rescue. I'm thinking of posting an extract from it on this blog but, as it is currently entered in a competition, I thought I'd wait to see the outcome from that first.